In the animal welfare world, Ginger and Kimchi are rock stars. Theirs is a story that no one could have predicted. 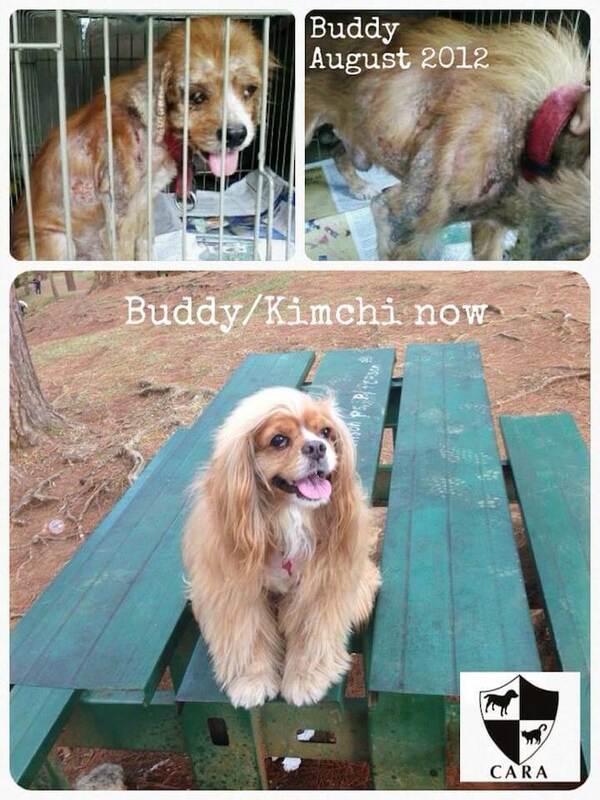 Once upon a time, like in 2012, Kimchi was a sad and abandoned stray, wandering the streets of Alabang, starving into nothingness with every day. He was malnourished, mangy, and flea-infested. We don’t know how long he has been on the streets until a volunteer from CARA Welfare Philippines spotted him and rescued him. Nor do we know how he came to be a stray. Did he get lost? Or was he abandoned? We wouldn’t be surprised if he was abandoned. Kimchi is a senior King Charles Spaniel mix. His owner might have thought he was too old to be cute. Or he got sickly and his owner didn’t care to provide him treatment. Most people think that only aspins and puspins are abandoned. Most people are wrong. We in the animal welfare world get a lot of reports of pure breed pets being abandoned by heartless owners, unfortunately. In Kimchi’s case, what mattered was that he can leave all that behind. Volunteers treated him and provided him shelter. Eventually, he got better–but his eyesight did not. He was going blind. Years of neglect had taken its toll. The volunteers were worried. His illness will make him unattractive to adopters. Then enter into the story a husband and wife, Eric and Thea Suguitan, and their beloved fur baby, a Golden Retriever named Ginger. Eric and Thea wanted a sibling for Ginger who they considered their daughter. Ginger was not very sociable and could not get along with other pets. The couple hoped Ginger will benefit from the companionship of another dog. They wanted to adopt an Aspin that CARA had recently rescued. Unfortunately, Ginger and that dog hated each other on sight. Like a stroke of destiny, Kimchi was at the CARA clinic that time. 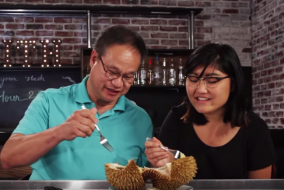 The couple brought Ginger close to Kimchi to see what will happen. To their surprise, Ginger took to Kimchi like an older sister to a beloved baby brother. They liked each other! Where before Ginger could not tolerate another dog approaching her, now she stuck to Kimchi and would not leave his side. So Eric and Thea ended up adopting Kimchi instead. They seem to have mental telepathy between them. They walk as one unit. This case is quite unique in the country. We don’t know if there is a similar case. If you know of one, do share with us. So, now, Eric, Thea, Ginger, and Kimchi live happily together in a house full of other sibling cats and dogs. Eric and Thea had rescued and adopted quite a few more fur babies over the years. They joined CARA as official volunteers after adopting Kimchi. According to Thea, Ginger and Kimchi both enjoy road trips, and are often brought along on family vacations, and to pet events. My favorite time to hug Kimchi is in the morning on my rest day because he is sleepy and allows me to hug him for hours on end. I sleep again with my arms wrapped around him. I greet him each morning. He still jumps up on my lap the minute I get home for a cuddle and a hug. Kimchi is scared of thunder, heavy rains, and storms. He jumps up on the bed to snuggle up to us when he’s scared. I think it’s because he was abandoned during the rainy season. It’s heartbreaking to imagine that he was wet, cold, hungry, and could not find shelter in the streets of Alabang. As a speaker for CARA, Eric is often invited to speak about responsible pet ownership by various schools and business institutions. He brings Ginger and Kimchi along to drive the point of adopting over shopping for pets. Over the years, they have earned the title of CARA AmbassaDOGS. These CARA AmbassaDOGS are gaining quite a following, in fact. They have been featured in blogs, magazines, and TV shows–most recently in Matanglawin on ABS CBN. Newest adopted sibling, T-Bone, is rather goofy. He was given up by a household who could no longer take proper care of him. If you have an event and would like to invite Ginger and Kimchi you can do so by emailing their parents Thea and Eric at events@­caraphil.org. More power to Ginger and Kimchi! You give us joy and are certainly helping advance the cause of animal welfare in the country with your sheer joy of life and love for each other. Thanks, Eric and Thea, for being such loving parents. Did you enjoy this story? Do you have other heartwarming pet stories to share? Let us know in the comments! I’ll be with you ’till the end. Click the links to read about the rescued dogs that transform into Star Wars characters and about a confidently beautiful chihuahua. Are John Lloyd Cruz and Ellen Adarna in Paris?